This web page will teach you the difference between major and minor chords. It uses the chords of Johann Pachelbel’s famous Canon in D, as set out in the Musicarta Canon Project, a series of piano/keyboard lessons which uses this delightful and adaptable chord sequence to teach ‘music theory that works’, and that much-loved pastime – messing around with chords! Click through here to see if the Musicarta Canon Project is just what you need to kick-start or re-start your creative journey. Telling the difference between major and minor chords is easiest if we use root position triads. Play these chords, near the middle of your keyboard. The three major chords have been grouped together, followed by the two minor chords. Here are the chords in the table above played from the top of the table down. Note that chord symbols take it for granted that a chord is major. ‘D’ means D major. You have to specify if it’s a minor chord by putting the lower case ‘m’ right after the capital-letter chord symbol. E.g. Bm (say "B minor"), or F#m ("F sharp minor"), for example. Also, you don’t have to say ‘major’ (except to avoid ambiguity). “D” (the chord) means D major. There are two differences in the chords. The first is pitch – how high or lower the chords are. This is not what we are interested in here. The second is tonality – the first three chords are major, the second two are minor. Can you tell whether each of the five chords is major or minor just by how it sounds? People often say that the major chord has a ‘happy’ sound, and the minor chord, ‘sad’. 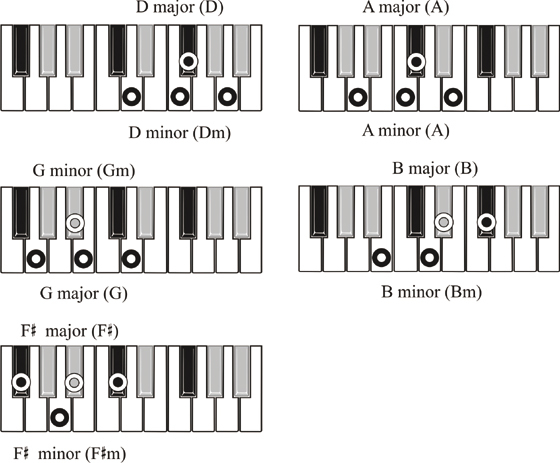 Here are the chords again with their major/minor quality specified. 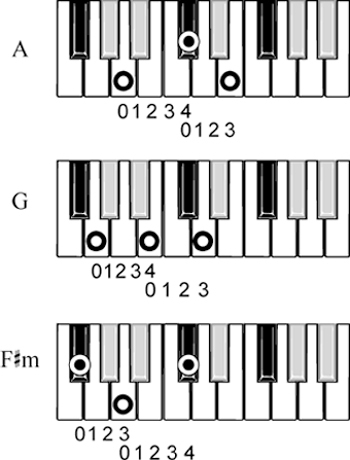 This might still not be clear, because the chords are higher or lower and this confuses the issue. Here are the chords again, this time, each one changed into its opposite quality. then back. All the triads in the audio clips are root position triads (‘PMPMP’ chords – see box below), but still some are major and some are minor. In order to see why, we have to count semitones, not just scale tones. 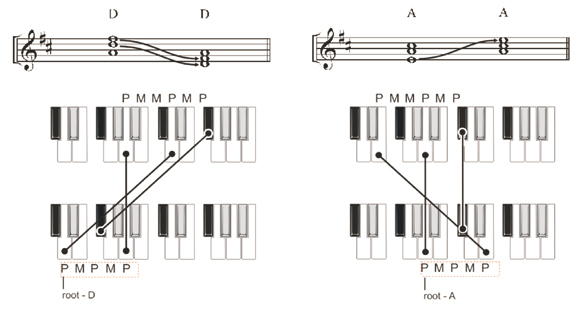 This method is easiest with root position triads – one of the reasons why the Musicarta Canon Project methodically rehearses the inversions-to-root-position operation (Module Six). Two things to note before we start. We start counting semitones from zero, the same way as we use a ruler. The numbers in the following apply to major and minor triads in root position only. The first thing we notice is that all the pairs of outside notes are seven semitones apart – so that’s not what makes them different. This seven-semitone distance is properly called ‘a perfect fifth’. For now, we can say just ‘a fifth’. Count the scale tones or note letter names to check – you will find there are five (see illustration). Remember that when we count ‘intervals’ like a fifth or a third, we start counting scale tones from ‘one’ – there is no zero. When we count semitones, however, we do start from zero, as on a ruler. The difference between root position major and minor triads is whether the middle note is closer to the bottom note (the root) or closer to the top. In root position major triads, the middle note is closer to the top. In minor triads, it’s closer to the bottom. The difference is only one semitone. Count the semitones in the other major and minor chords to make sure you understand. You should get from zero to either ‘3’ or ‘4’ semitones between the next-door notes. If not, something’s wrong. In a root position major chord, the third (the middle note) is four semitones (two whole tones) above the root. This interval (distance) is called a ‘major third’. The middle note is closer to the top than to the bottom of the triad. In a root position minor chord, the third (middle note) is only three semitones (one-and-a-half whole tones) above the root. This interval is called a ‘minor third’. The middle note is closer to the bottom than to the top of the triad. 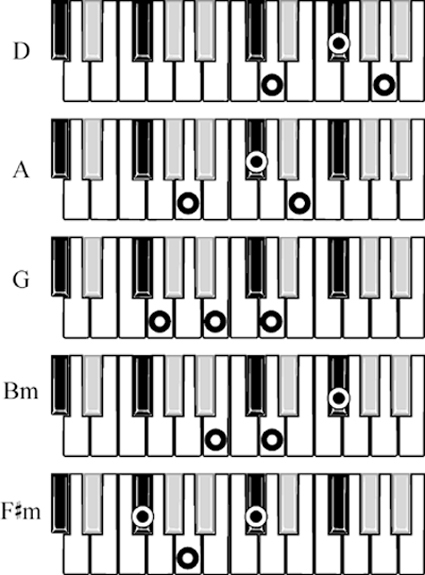 Chords have to be in root position to use this semitone counting method. In order to know whether the triad you are working with is in root position, you have to know the scale you are using. (This is why scales are so important!) You would normally use the scale of the key your piece is in (D major, in this case). 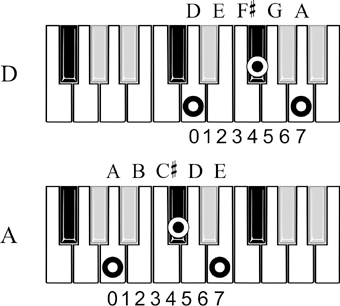 If you don’t know what the key is, use the scale of the chord itself. You can make minor chords out of the Canon major chords and vice versa just by shifting the third (the middle note of the PMPMP chord) a semitone up or down. For practice forming major and minor triads, use the following table on this page and copy the following audio performance demo. Play around with the major-minor chord difference. Learn to build major and minor chords on any root, and practice inverting them using the Musicarta Inversions method. Listen with purpose to your music and ask yourself if the chords you hear are major or minor.